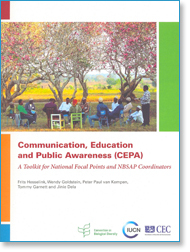 Frogleaps aims to add value to the Toolkit for Communication, Education and Public Awareness (CEPA toolkit). IUCN CEC developed this toolkit in 2008 for the Secretariat of the Convention on Biological Diversity. Target audiences are focal points for the Convention of Biodiversity and professionals working on the implementation National Biodiversity Strategy and Action Plans (NBSAP). The CEPA toolkit offers fact sheets, checklists and practical examples from all over the world. -Section 1: Why do we need CEPA and how to start? -Section 2: How to network and raise awareness? -Section 3: How to engage stakeholders and mainstream biodiversity? -Section 4: How to plan communication strategically?